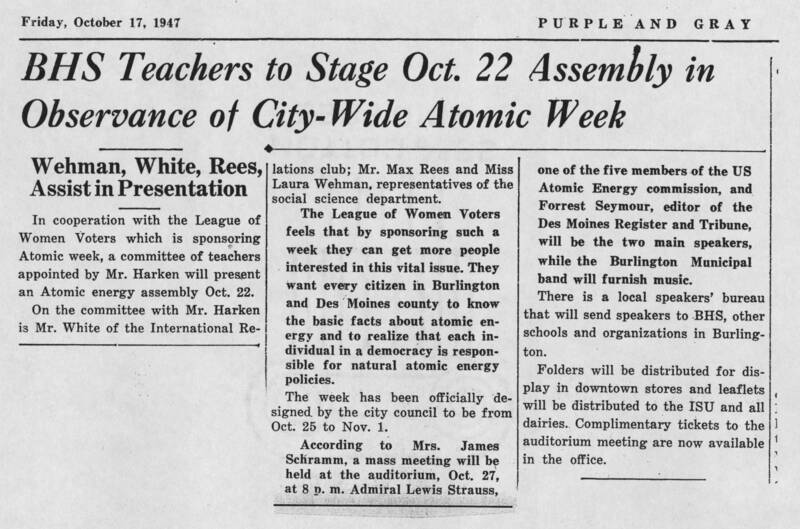 Friday, October 17, 1947 PURPLE AND GRAY BHS Teachers to Stage Oct. 22 Assembly in Observance of City-Wide Atomic Week Wehman, White, Rees, Assist in Presentation In cooperation with the League of Women Voters which is sponsoring Atomic week, a committee of teachers appointed by Mr. Harken will present an Atomic energy assembly Oct. 22. On the committee with Mr. Harken is Mr. White of the International Relations club; Mr. Max Rees and Miss Laura Wehman, representatives of the social science department. [[bold]]The League of Women voters feels that by sponsoring such a week they can get more people interested in this vital issue. They want every citizen in Burlington and Des Moines county to know the basic facts about atomic energy and to realize that each individual in a democracy is responsible for natural atomic energy policies. [[end bold]] The week has been officially designed by the city council to be from Oct. 25 to Nov. 1. [[bold]]According to Mrs. James Schramm, a mass meeting will be held at the auditorium, Oct. 27, at 8 p.m. Admiral Lewis Strauss, one of five members of the US Atomic Energy commission and Forrest Seymour, editor of the Des Moines Register and Tribune, will be the two main speakers while the Burlington Municipal band will burnish music. [[end bold]] There is a local speakers' bureau that will send speakers to BHS, other schools and organizations in Burlington. Folders will be distributed for display in downtown stores and leaflets will be distributed to the ISU and all dairies. Complimentary tickets to the auditorium meeting are now available in the office.